Ping sites are great source for the faster indexing of your blog/website content. It simply tells Search Engines and RSS directories (Google, bing, yahoo) that you have updated new content on your blog or made changes in your blog. It's a short time process to index your blog into major search engines. The process of pinging is very simple; just enter your website's title and URL on the ping website, hit the ping button and that's it. It will inform all the major search engines about the new content on your blog or website. Pinging process can be a very useful method to increase your site's traffic. Say you have wrote a completely SEO optimized article on a trending topic if it will be indexed properly and fastly then it will drive huge traffic towards your website. But what if it will not index properly? then your SEO optimized article is worth for nothing. No extra effort or any type of SEO training is required to ping a blog rather you can say that you've got one new SEO tools without spending a penny. The main benefits of ping websites are faster search engine indexing, increment in traffic and increased visibility of your website or blog. Below is a huge list of 30 ping websites to ping your website or blog. All the websites are hand picked and working properly. You can select any of them to ping your blog. 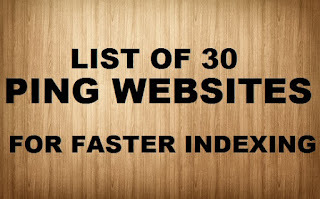 This was a complete list of High PR Ping Websites to index blog or website faster. Some of them are of PR 7 too. So if you're not interested to ping your website through newly launched ping services then go for the ever green trusted ping sites. If you have any doubt or query then feel free to leave a comment below in the comment section.